For the past few years, I have been seeking to demonstrate that every peak (for some version of “every” and “peak”) in the lower 48 is a dayhike. From Gannett in the Winds, to Oso and the Guardian in the San Juans, to Whaleback in the Sierra, I have put in countless hours of morning (and sometimes evening) headlamp time in the pursuit of type II fun. The Northern Pickets are arguably the most remote peaks in the lower 48, so my recent traverse can be seen as a fitting end to this project. Along the way, I have learned what is necessary to accomplish this goal, developed the necessary physical and mental skills, and also learned my limits. I am a decent distance runner, but nowhere near fast enough to compete with modern ultra runners. I am a decent scrambler, but any semi-serious climber can get up things far harder than I can. Yet I see few people doing the kind of fast and light peak-bagging I enjoy, leading me to believe that, with a bit of patience and determination, most people can accomplish far more in the mountains than they realize. So, is everything in the lower 48 a dayhike? I smile at having left the question somewhat unanswered by taking more than 24 hours for the Northern Pickets. I believe that I could pick them off one-by-one in less than 24 hours apiece, and it seems possible that I could do the traverse in under 24 hours by exiting via Hannegan Pass, but I will not try to demonstrate these things. Someone else is welcome to do the math, then make it happen. When I took a running class at college 50 years ago, the final exam was to run a 10.3 mile loop (speed not too important). During the term I frequently ran routes 5 or 6 miles. But not further. Conclusion, I ran 10.3 rather comfortably. Later I went on to run a few marathons (6). Moral to the story, for many of us, I think we have no clue what our limitations are. 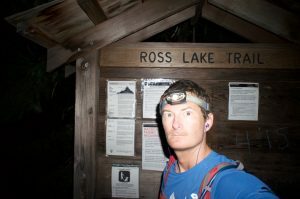 Scott Barnes (of recent SC fame) has broken right through Bob Burd’s 24 hour time limit and found with sufficient energy you can go much further in the wilderness. One risk is if you get injuried (alone) deep in the woods costs may be high. I like the 24 hour limit — otherwise you end up with grim, sleep-deprived misery like RAAM — but having witnessed Scott’s feats and enthusiasm at last year’s Challenge, I look forward to seeing what he does in the future. Yes, there’s risk from traveling light and solo in the wilderness, but I don’t think my day-hiking is significantly riskier than the driving I do between trailheads. Hi Sean, it’s me Mike the plumber. I have been following your adventures for a couple of years now. After reading your last traverse post and this followup, “Is everything a day hike”, I am left wondering if your mountain adventures will take a different direction. I so enjoy reading about what you are able to accomplish in such short time frames and try to imagine what it would be like. Do you have some future goals that might not make “everything a day hike? Just wondering. Also, are you by chance planning to be at, or near the Ranch on 8-21-17 for the eclipse? Take care. Apologies for the long-delayed response. I’m still figuring out the details, but I intend to stick with my fast-and-light approach in the near future. I feel that I am at an age where I should play to my strengths. Fast and light peak bagging is my favorite athletic pursuit. I love reading these trip reports. I’ve got some big goals for the next few years and I appreciate the inspiration. Awesome! I look forward to reading about your exploits.